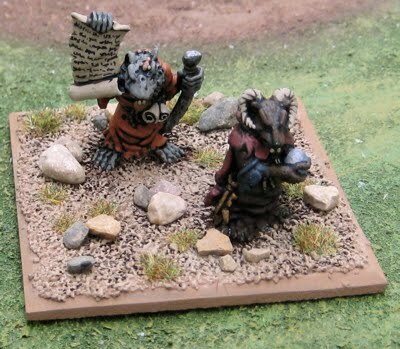 Here, at some point, will be pictures of all my 28mm Medieval and Medieval-ish Fantasy Hordes of the Things armies, skirmish forces and dungeon bashers and denizens. Robin Hood and Friends from Casting Rom Miniatures. 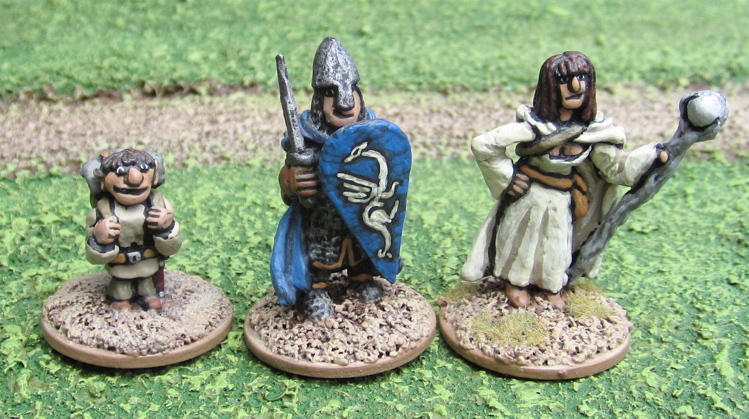 These are three figures i modelled, moulded and cast for a Party of characters I had started off on the Dragonlance series of modules. we'd used Savage Worlds and I think got to the thrid module before packing it in. from right to left is a halfling (played by Patrick), a paladin (played by Christian), and a Human mage (played by Amanda). 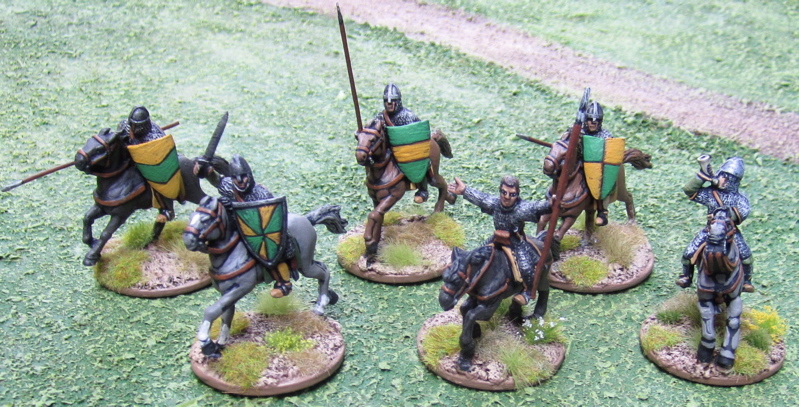 Mounted Men-at-Arms – 6 points - Crusader Miniatures. 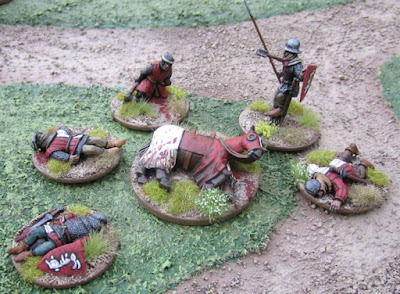 Archers #1 – 4 points (could be upgraded to “expert” for another 2 points…) - Wargames Foundry – with a few home-cast figures hiding in the back that I added to fill out the ranks! 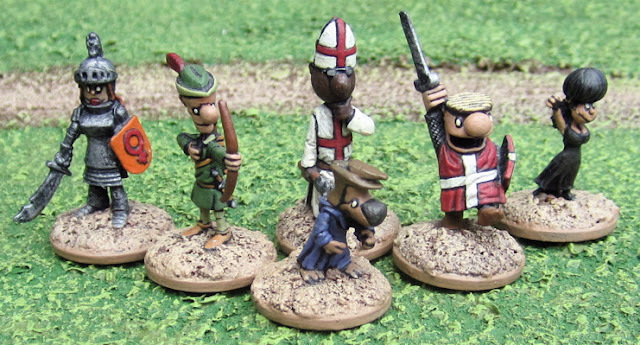 Archers #2 – 4 points (could also be upgraded to “expert” for another 2 points…) - as above. Another Retinue for Lion Rampant I have in the works. It will mostly be swarms of Kerns - Fierce Foot and Bidowers - but will also have some hard-hitting Galoglass and some other stuff. Galowglass - I suppose this could be broken up into two groups of Foot Men-At-Arms (@6 points each) or I was thinking "Expert" Foot Sergeants (@6 points for the lot of them). Figures are from Old Glory Miniatures. Irish Wolf Hounds - perhaps a bit of an anachronism... but I have them and they seemed like a fun idea. There aren't any rules for them per se (perhaps in Dragon Rampant) but for now - if I got enough of the other Irish done to have a battle they could be fielded as "Fierce Foot". 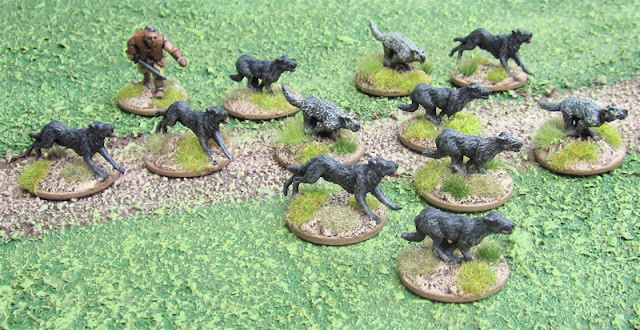 Most of these are from Crusader Miniatures (the pack master and most of the slightly larger irish Wolfhounds) but there are three (slightly smaller and lighter) Irish wolfhounds from Gripping Beast. Halfling Elements of Hordes of the Things. I never intended to make an entire halfling army for Hordes of The Things. I always figured they might be allied elements of some other army... Perhaps in a campaign when a certain area is taken over halfing elements could be recruited...? 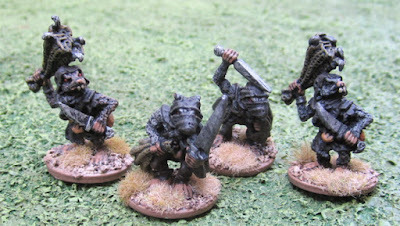 Halfling Shooters - figures from Games Workshop. Other halfling elements... I'm not sure what to class these as...? More shooters? There's only one archer and one slinger on each on the element... In DBA I'd class them as Psiloi or Auxilia. Warband...? 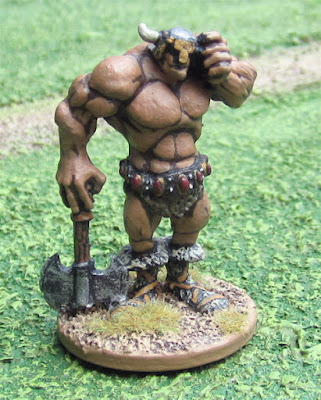 Halfling don't seem nearly ferocious enough to be classed as Warband... but not nearly awful enough to be classed as Hordes! The figures are by Mark Coppelstone - some may be from Coppelstone Castings, some may be some earlier ones from Grenadier Models. 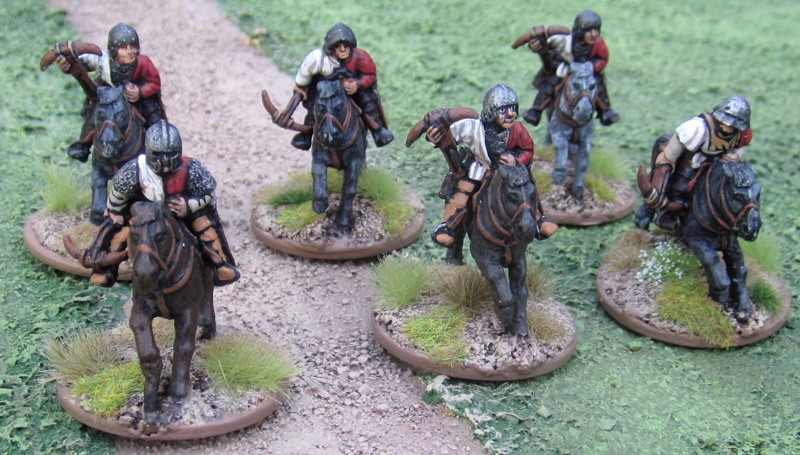 A whole warband worth of them - from assorted manufacturers. 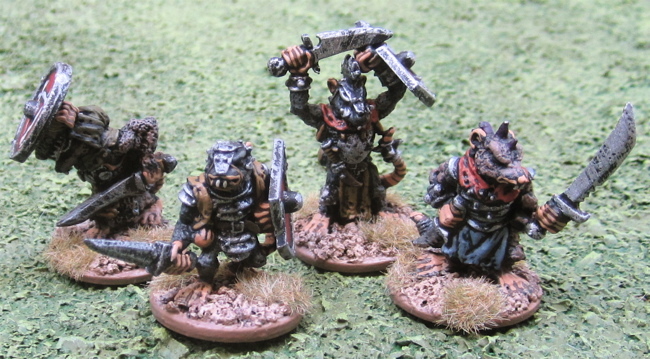 I've wanted to run a halfling warband in a Song of Blades adn Heroes campaign... perhaps this fall! Older Citadel (Games Workshop) Halflings. I've had these for a long time - they served in Empire and Bretonnian armies and have, in recent years been stripped and repainted. 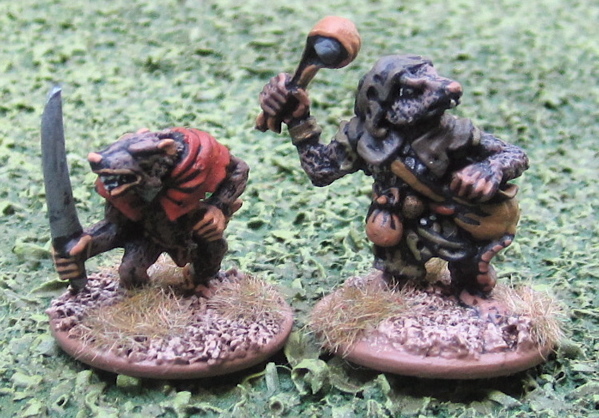 The fellow on the right is the oldest halfling figure I have. I think it may be a Heritage model...? I've had it close to thirty years and was used for one of my very first D&D characters. He has been painted and repainted and stripped and repainted a number of times and is one of my all-time favourite figures. The other fellow is, I think, from Mithril Miniatures? Assorted halfling folk from Reaper Miniatures. 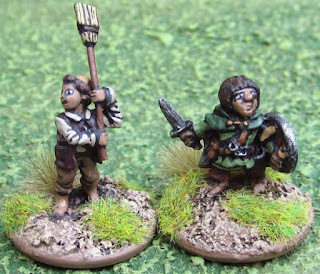 Halflings from Coppelstone Castings - these are some of my favourites - they look like they are ready for adventure. I have no idea who made these. 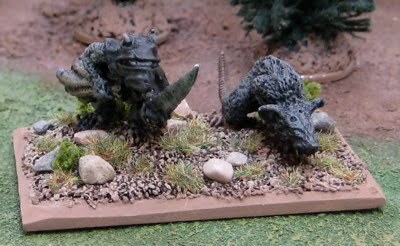 I picked them up off ebay with intentions of making them into a Halfling Spear Element for Hordes of the Things. When I finally got to painting them I was more interested in Song of Blades and Heroes skirmishing... so they got the individual base treatment. Despite these being "done" I wouldn't mind - at some point - to pick up some (or ALL!) 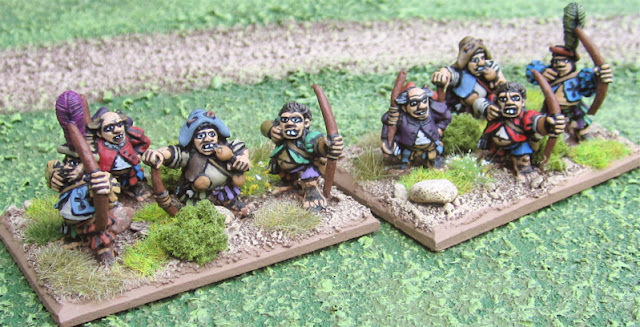 of John Pickford's Halflings from Wargames Foundry! 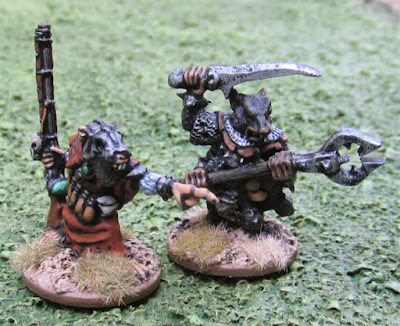 A few years back my friend John gave me all his old Skaven miniatures – figuring he’d likely never play Warhammer Fantasy Battle (for which he had collected them) again. I rebased a bunch of them for Hordes of the Things a few years back, and from time to time have been painting some of the ones that never got painted – and repainting some that had been – to put together a Hordes of the Things army of my very own and a small warband of individually based Ratlings that I could use for some sort of fantasy skirmish game. Ratlings with sword and shield (or sword and dagger, in one case...). I have a lot of Elves. Four Drawers full of them. 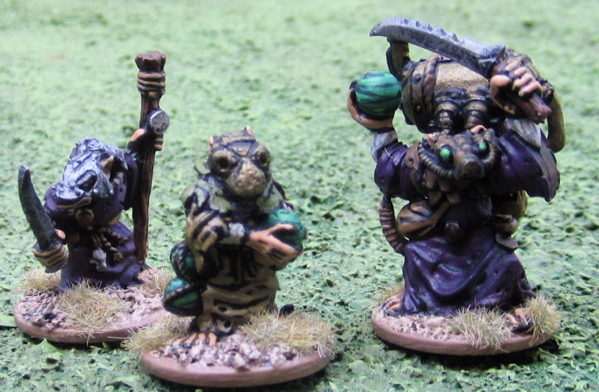 I think I had enough for 3-4 Hordes of the Things armies at one point - not all painted, mind you. I've kept enough to eventually have Two full Hordes of the things armies. 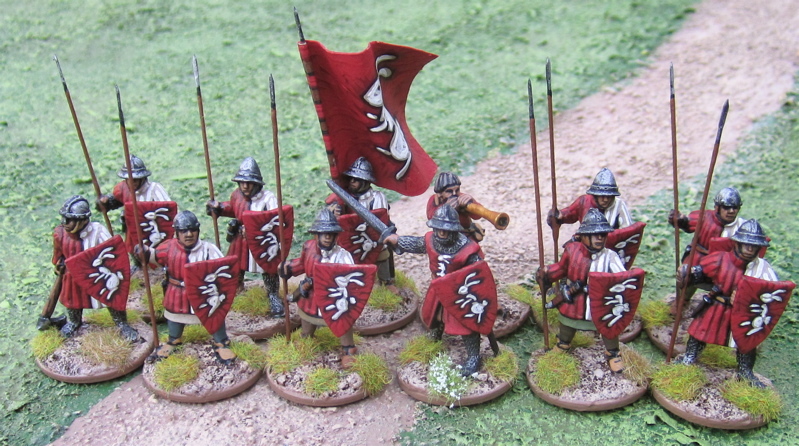 The rest are beign organized as Dragon Rampant warbands or just individual extras for smaller Song of Blades and Heroes forces or Frostgrave Warbands or assorted Role-playing games. 1x Elf Wizard (Light Foot, Single Figure Unit, Wizard) 7 points? 1x Elf Wizard (Heavy Foot, Single Figure Unit, Wizardling) 6 points? 1x Elf Wizard (Light Missiles, Sharpshooter, Single Figure Unit) 6 points? Still more to come... at some point. Hey Tim, amazing work. 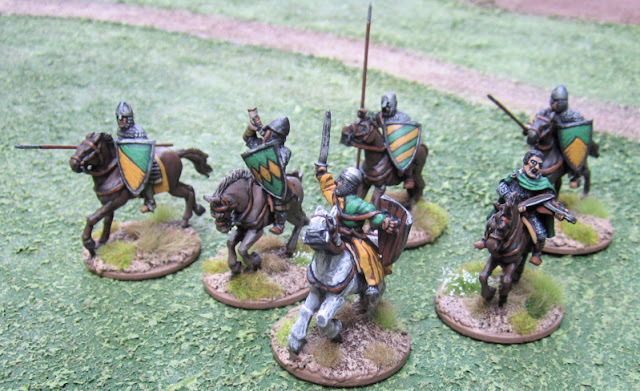 Just wondering--the green and yellow knights I know they're old glory, but which specific models are they? The normans? Thanks. Thanks! I'm not entirely sure. I got them in a trade. I have a feeling they might be early crusader knights? Yeah I just wanted some of my own.